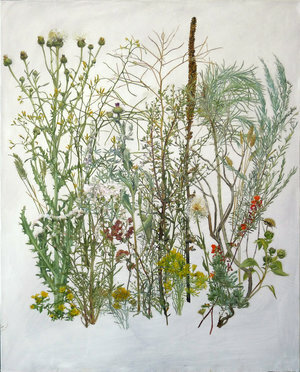 Curated by Katie G. Whipple, Florilegium will feature over 30 works of painting, illustration, and sculpture, as well as botanical installations and floral designs. The works range from minuscule specimen illustrations to a six foot by twelve foot floral painting, and from traditional oil still lifes to living floral sculptures. Florilegium showcases each artist’s relationship with nature, creating an immersive sensory experience. This is a show that is meant to be experienced in person, so visitors can explore the textures of life in nature and in art. Katie G. Whipple grew up in central Indiana painting with her mother, artist Libby Whipple. After graduating high school, Katie decided to forgo a traditional college education and moved to New York City to study academic painting at the Grand Central Atelier. She has since been the recipient of many awards, including scholarships from the Grand Central Atelier and a purchase award from the Indiana State Museum. Most notably, she received the 2013 Alma Schapiro Prize, which sent her to the American Academy in Rome to study the work of the old masters. She now works full time as a professional painter, teaches part time at the Grand Central Atelier, and lives in Queens, NY with her husband, artist Brendan Johnston, and their dog, Theo. Florilegium is Katie’s first curated show.